The latest tattoo genre resulting from the liberation of creativity in the 1980s that was more or less officially accepted by the tattoo community is the homemade tattoo. In many respects homemade tattoo can be called a bridge into the tribal past of the craft in both design simplicity and magical function. As it may be clear from the name, homemade tattoo is a DIY embranchment of tattoo culture, which is practiced by non-professionals within homely staging and often with no specialized equipment. However, there exist another layer of values on this tattoo style, apart from classic representational and informational-exchange function of the tattoo. It can be said that homemade tattooing is the manifestation of connecting of a tattooer and person getting tattoo, the symbolic ritual that results in a concrete material sign, and the whole process became the embodiment of the eternal bonds that are being created. In a mainstream tattoo culture similar event can be also spotted – the case here would be matching (or pair) tattoos. Pair tattoos are tattoos of similar designs that complete each other (two halves of a heart etc.) and are made by two people to emphasize personal feelings towards something or somebody, or, more often, each other. Though the connection function in this case beyond doubt is present, the way of its production and its result differs from homemade tattoos. 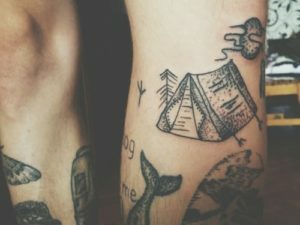 In the same time matching tattoos and homemade tattoos have certain common characteristics – in both cases two people are present, the connections are being established and the process results in (or rather manifests in) body modification. However, if the paired tattoo offers to the participants the possibility to share identity, homemade tattooing would rather be a trade-off. One of the possible perspectives on it can be achieved with the help of Victor Turner’s Ritual process: Structure and Anti-structure (1969), where Turner describes liminality as a conversion process, that sets individual (so called “threshold people”), to put it simple, in a transition process between positions of the socium in various particular cases. However, in the case of homemade tattoo the point of view on the transition process has to be shifted and the object has to be changed from the individual (with attributes as position and state) to the pair, where both parties primarily possess different, or even inverse, positions and intentions. As in Turner, the process of tattooing here can be best described with three stages: first stage would be the stage of connection – when the potential tattooer and person who is getting tattoo establish trust and certain connection, that has to be strong enough to proceed to the next stage – the process of tattooing. Here, the actors are being separated by the roles they fulfill during the whole process, the role of the tattooer – one who gives the sign, and the role of the tattooed – one who receives. Last, after tattooing is done, both participants, likewise during tribal initiations, reunite to share new connection that they have created.